On October 2nd, 2016, the Downey Arts Coalition and the City of Downey present a celebration of Art, Film, Space and Downey’s 60th Anniversary. 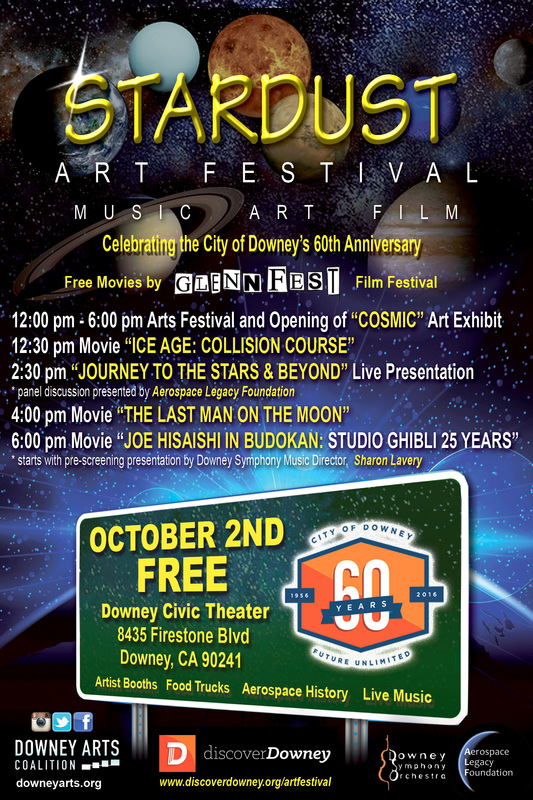 “Stardust Art Festival” takes place 12PM to 6PM at the Downey Civic Theatre, with free movies provided by GlennFest Film Festival including Ice Age: Collision Course, the astronaut documentary The Last Man on the Moon, and the anime concert film Joe Hisaishi in Budokan: Studio Ghibli 25 Years. The Aerospace Legacy Foundation presents a panel discussion about Downey’s role in aerospace history, “Journey to the Stars and Beyond.” There will be artist booths on the plaza, live music, food trucks, and “Cosmic,” a special curated art exhibit in the theatre lobby. Art Walk noon to 6:00 p.m. The Last Man on the Moon (4PM) is an impressively crafted, affectionate portrait of astronaut Gene Cernan and, by extension, the program that concluded with Cernan’s 1972 Apollo 17 landing. Conveyed in first person through the razor-sharp recollections of the now 81-year-old Texas rancher, the film traces Cernan’s career trajectory, going back to his days in San Diego as a hot-shot naval aviator, blending terrific archival footage with contemporary perspectives to quietly poetic effect. More information and trailers at www.thelastmanonthemoon.com. Ice Age: Collision Course (12:30PM – PG) is the fifth movie in the popular series from Blue Sky Studios. Manny the mammoth starts to worry when his daughter Peaches announces her engagement. Still unlucky in love, Sid the sloth volunteers to plan the couple’s wedding. To Manny’s dismay, nothing can stop the upcoming nuptials, except maybe the end of the world. When Scrat accidentally launches himself into outer space, he sets off a chain reaction that sends an asteroid hurtling toward Earth. Now, the entire herd must leave home to explore new lands and save itself from Scrat’s cosmic blunder. Website.